An important caveat with ACHD is that most women with congenital heart disease can have a successful pregnancy with the proper care. Because this is not the case with everyone, it is IMPORTANT for adult women with congenital heart disease (repaired or non-repaired) to seek consultation from an Adult Congenital Heart Center prior to becoming pregnant to review their individual risks. 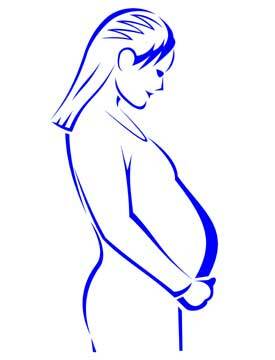 During pregnancy, there are considerable changes in a woman's cardiovascular system. Red blood cell mass increases 20-30%, plasma volume may increase by as much as 50%, and heart rate typically speeds up by 10 beats per minute. In addition, blood pressure and pulmonary and systemic vascular resistance are reduced. There is an increase in cardiac output to as much as 50% above pre-pregnancy levels by the 32nd week of gestation. Cardiac output rises to as much as 80% more than pre-pregnancy levels during labor and delivery, when blood pressure and heart rate also rise significantly. After delivery, it may take as much as 4 weeks for the mother's cardiovascular levels to return to normal. Because of these increased demands, two key questions really need answering for a woman with ACHD; what is the risk to the mother and what is the risk to the fetus?